Postcard US-3429537 to France shows a northbound San Diegan train, in the form of two Budd-built Rail Diesel Cars (RDC's), pulls out of Santa Ana, California. The photo was taken by Thomas H. Gildersleeve on July 3, 1952. Those cars were brand new and were placed in service on May 21, 1952. 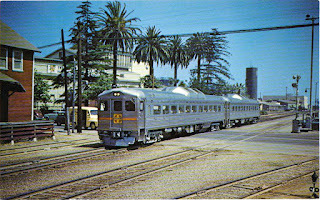 According to Thomas H. Gildersleeve, "the first San Diegan was inaugurated as a diesel powered streamlined train on March 27, 1938, and it soon evolved into an entire fleet of Los Angeles - San Diego trains encompassing three sets of equipment, each of which made two daily round trips. After the RDC was introduced, Santa Fee purchased this one pair to replace one of the conventional streamliner sets in San Diegan service." "The RDC San Diegans lasted until January of 1956, at which time they were reassigned to train No's 311 and 312 between Newton and Dodge City, Kansas, as it was felt they lacked sufficient seating capacity for continued service on the popular San Diego line. In their new assignment, the cars displayed a more conventional Santa Fe paint scheme with the usual red and yellow front end, and one of the cars sported a baggage section, making it similar in appearance to an RDC-2. The cars climaxed their career on the Santa Fe by operating out of Carlsbad, New Mexico." The card features two of the five 1999 33-cent USPS commemorative stamps titled "All Aboard!" The original water color illustrations used on the stamps depict art deco-style passenger trains of the 1930s and 1940s. On the far left was the Super Chief, famous for carrying motion picture people between Chicago and Los Angeles, also known as the "Train of the Stars." On the second left was the Congressional which followed a route between New York and Washington, D.C. Its slogan was "Every Mile Electrified."